The PC version of this game is finally out! Steam users and those who order the actual disc / CD will be thrilled to begin their fun adventure with this game. While the console release was a while ago, many have not yet played this game and held out for the PC versions. This guide isn’t just to help PC users troubleshoot and fix their gaming problems, but also Xbox 360 and Playstation 3 users. Check out our game fixes below and if you know of any others, we would love to hear them. Just a FYI here, but these game fixes apply to also the collector’s edition. This problem is being looked at by the developers already because they are aware of it. Expect a patch to be released soon. There is no set date for it yet though. After getting the game from Steam or elsewhere, some users find after they install it, register it, entered the code, then try to play the game, they get this “this code was already used” error message. This seems to be more common with the Collector’s Edition, but that may be a coincidence. I suggest contacting support and having them give you a new key if possible. Depending on how you got the game, you may also be able to return it for a new one and thus get a new key. We are currently unaware of any game solutions for this problem. If you have any, please comment, as we and many others would LOVE to know! If you are experiencing this error, then try to run the game through other means. For example, launch the exe directly instead of using a shortcut or vice-versa. Try launching the game with Steam too. If that does not work, then reinstall the game. This is usually encountered when attempting to join multiplayer or when entering things like exclusive content key codes or uplay. Unfortunately, the only thing to do is wait. Their servers are likely swamped at the moment from all the publicity the game has been getting. This is normal for new releases. Try again during off hours or after some of the game buzz has died down a bit. The usual methods of solving game sound issues apply here. Apparently version 2.03 helps with this. No solutions are available at this time. There’s not much that can be done about this. Await patches and ensure that you have a stable internet connection. If your game has these symptoms or is stuttering / jittery (odd frame rate), then the below suggestions may help you. These suggestions also help with “Assassin’s Creed has stopped working. Windows is trying to find a solution to the problem”. This appears to be happening for some people. While I have no suggestions for the trophies specifically, I do suggest trying to reinstall the game. Sometimes the INI is lost and it doesn’t re-spawn or a directory / file was set to “Read-Only”. Ensuring that the config file exists and making sure it doesn’t say “Read Only” is a good idea. Also when installing it do so with full administrative privileges / rights and disable any security software. Several people who’ve encountered this problem have formatted their computers, which fixed it, but is NOT a viable option for most people. Many of the PC users have been experiencing crashes or game freezes after trying to enter multiplayer mode. This usually results with the game being locked up in full screen mode and it forces you to restart your computer. The problem may be related to Realtek sound cards. Of course, other game problems may cause it too, but there is definitely a trend. Try these fixes. Not only does AC:B suffer from mouse problems, but so does Assassin’s Creed: 2. It may feel like the mouse movement is lags / is lagging, or is jumpy / jumping around. Some people call it mouse movement stuttering. At the moment, we do not know of a good fix for this, but we’re actively looking. Many games allow you to modify their INI files to fix this, but this very well may not apply to this game, nor Assassin’s Creed 2. Let us know if you have any solutions for this. We will be actively looking. If you pre-ordered the game, then you you may have the extra Digital Premium Edition content. 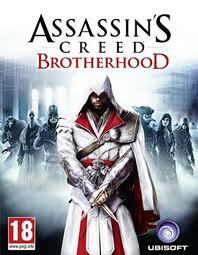 This includes things like a Soundtrack, Collectible Trading Cards, Movie, The Original Codex Written by Altaïr, and more. They’re located: Programs Files\\Steam\\Steamapps\\Common\\Assassins Creed Brotherhood\\ in the deluxe content folder. The Xbox 360 game fix for that error message is different than the Playstation 3 version and more annoying. Apply all the latest patches. These patches have solved many of the problems (such as failed launch). Verify as well that your disc isn’t scratched. If the updates are not showing, then make sure to verify that you are connected to the internet before starting the game. – Fixes an issue that prevents the player to access the DaVinci Disappearance DLC under certain circumstances. – Fixes 2 random crashes. – Fixes an infinite loading problem in the game menu. – Fixes a bug where a player may not appear on radar in Assassinate game mode. – Fixes a bug where the player may get stuck in a white screen in certain conditions. Note: I am sure you can find the patch for download on other mirrors if that server is slow. People commonly mirror this sort of thing at places like MegaUpload (MU), RapidShare (RS), Hotfile (HF), MediaFire (MF), and more. This entry was posted	on Tuesday, March 22nd, 2011 at 6:46 AM	and is filed under . You can follow any responses to this entry through the RSS 2.0 feed. You can leave a response, or trackback from your own site. I have a problem.When I’m playing Christina’s last mission after accepting the mission.It goes into white screen and suddenly it returns to Windows 7 interface saying that ACB is not working.Could anyone please help me? Mate, interesting link to get windowed mode… I really hate full screen. I’m running the Steam version, would that solution word? Also, where do I get the Skidrow 2 crack that’s mentioned as a requirement, and is that a safe file to run? damn im so freaking dumb..
i installed assassins creed brotherhood in to my computer by torrent..
when i launch it, it appears black screen..
i also run this as an administrator but still dont work.. I have skidrow rip and I just installed the da vinci dissappearence dlc, my problem is its neverending loading. I tried to download the patch from here, and when I run it it sais that the update is not compatible with the current installed game. I have no idea what that is, it is the skidrow rip as it came, and I have no idea how to find out which version do I have. it laggs like hell… any idea why? or how to solve it? this is better than the recommended? My only solution for the lagging was to run it off two CPU cores and disable VSYNC. With an i7 I left 0-3 checked and unchecked 4-7. Not really sure why this works, but with the i7 @ 4Ghz, 12GB ram, and 6970’s in crossfire, it still runs smoothly at max settings. Also I was able to enable VSYNC through the graphics card and override it being disabled in the game and although there is a little screen tearing still noticeable, it’s not nearly as bad. i have steam version of acb my game does not launch with launcher but games start fine in story mode without launcher i have skidrow crack and when i installed launcher then again game not start with launcher and when i open launcher its gives error “Please start the game you want to play instead” what can i do i want to play multiplayer but i cant. please help me please . plz i need help any one solve this problem plz. and thnxx ! I FOUND A SOLUTION TO MOUSE STEERING. U NEED TO OPEN TASK MANAGER AND SET Assassin Creed Proccess to NORMAL. when i want to play multiplayer mode it tels me to sign in with my ubi.com account how do i do that ?? i’ve read a hundred post and asked this question on all of them maybe someone can me my old ps3 quit working so i swaped it out for a brand new one before i did i backed up my ACBrotherhood save file on a flash drive (48 hrs 76 percent complete)when i restored it on my new system loaded the game hit story mode where my save file should be it says invalid save data i go to it it says that i am not the owner please delete save file or try loading from another save but i am the owner there’s got to be a way to unblock whatever is blocking me from using it i was told to use a hex editor is there another way please help please. Can you help me with this: when i installed my game, the ubisoft logo and its disclaimer played normally until i reached the main menu where an error box telling me its terminating something and when i run the game a second time, i got a white screen and had to reboot. I’m having a problem where whenever I interact with another player (i.e. one killing the other) the game lags severely, any fixes? My problem is crash, but it doesn’t fall into the category here mentioned. Mine is a complete crash. The game shuts down my computer completely. I’ve had this happen with AC 1 and now with Brotherhood. The only difference is that i managed to play for 50 minutes on BH before it crashed. But i only last 6 minutes inside the game. I’ve tried loads of things, including running the game as administrator. I even have my graphics cards updated and laptop matches the system requirements for the game. I’ve already contacted ubisoft, but i’m still waiting for their reply. Any ideas on what might causing this? It’s interesting because this only happens with assassin’s creed and no other game. It isn’t temperature/heat related either.